Is It Worth Getting a Singer Heavy Duty 4432 Sewing Machine? The Singer Heavy Duty 4432 sewing machine is one of those rare models that is appreciated by both experienced sewing enthusiasts and novices alike. It combines old-fashioned Singer durability with modern ease of use. You’ll be able to handle virtually any sewing task with this model. The Singer Heavy Duty 4432 has 32 stitches built in, including six essential stitches, seven stretch stitches and 18 decorative stitches. It also provides one fully automatic, one-step buttonhole stitch. 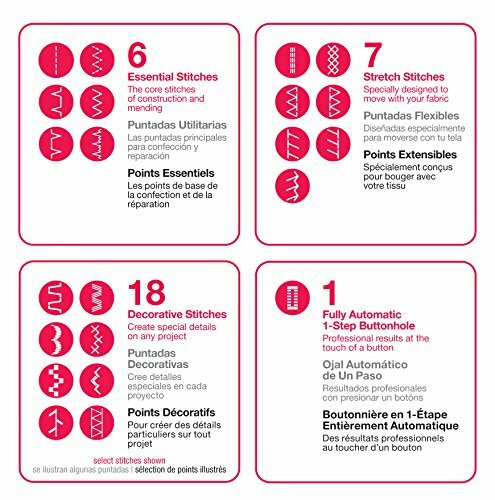 Three needle positions allow you to adjust your stitches for zippers, topstitching and everything in between. Because this model is designed to work with normal, lightweight fabrics as well as sturdier ones, you can use it for all your sewing needs. It handles satin and the finest of cottons – as well as terry, vinyl, denim, canvas and wool. Users love it for garment making, quilting, crafts and heavy-duty repairs, such as purses and belts. The presser feet snap on, and the 4432 also features an automatic-needle threader to reduce eye strain. The machine reverses with one flick of a lever, and pressure control for the presser foot is adjustable. Other handy elements include a top-loading, drop-in bobbin and a free arm. This makes getting at collars, cuffs and hems a breeze. An accessory packet, stowed in the hinged drawer on the arm cover, includes four pressure feet (buttonhole, button, zipper and all-purpose) – along with other basics. The Singer Heavy Duty 4432 sewing machine comes with a power cord, foot pedal and a soft cover. 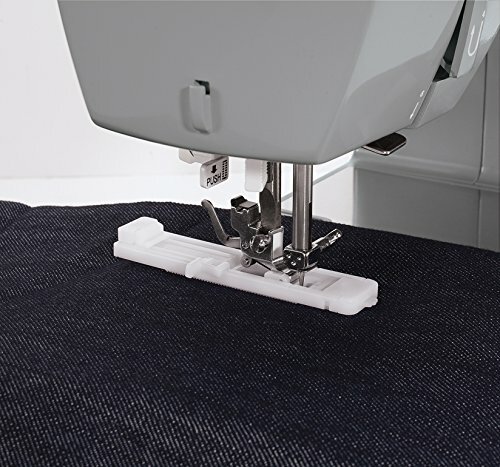 The quick start guide means you can set up and be sewing in minutes. 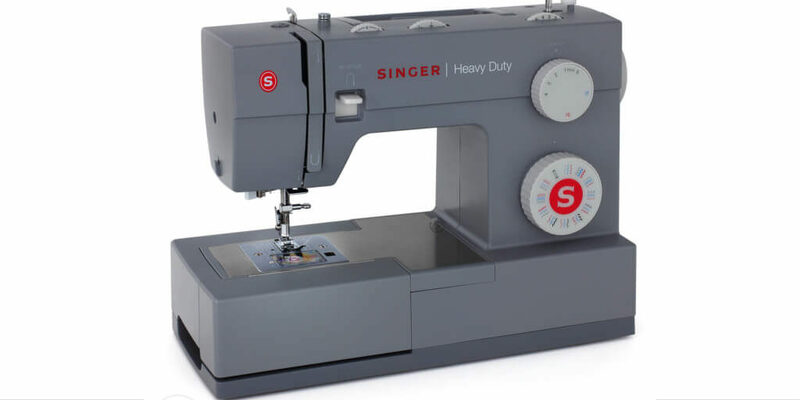 The biggest raves for the Singer Heavy Duty 4432 model come from users who sew primarily with thick fabrics. With the right gold thread, you can achieve a factory finish when hemming jeans. This machine makes quick work of mending and home-decor projects. At a rate of 1,100 stitches a minute and with a 60 percent stronger motor, it hums along. The stitch width on this model has a broad range, though. This means you can sew sheer window treatments and delicate lingerie with equal finesse. The box feed gives you steady pressure for fabrics of all thicknesses without dropping stitches. Some users, primarily less-experienced ones, have had issues with the speed getting away from them – resulting in skipped stitches. Others have wound up with ‘birdnesting’ – when the thread bunches in loops on the wrong side of the fabric. If you’re new to sewing, take care to set up the machine properly and be patient with yourself in the process. In addition to using the correct needle size and thread weight, watch this video to ensure success with threading and picking up the bobbin. With its reasonable price point, the Singer Heavy Duty 4432 sewing machine is a good buy for those new to sewing. However, many professional seamstresses and tailors enjoy using it as both a primary and backup machine. Singer supports this model with a generous 25-year warranty. The Singer Heavy Duty 4432 is constructed on a metal frame with a stainless-steel bedplate. This gives it durability and stability without being too heavy, weighing in at just under 18 pounds. If you’re used to an industrial machine, this one may feel a bit light at first, but you’ll like the portability if you need to move it around. Most users agree with us that this is a fantastic workhorse and should be considered by anyone who does frequent crafting and garment work. For the home-decor enthusiast, the Singer Heavy Duty 4432 sewing machine is ideal for upholstery, drapes and patio furniture cushions. Other fans include boat owners, who love its ability to handle sails and seat covers. Pet owners as well. This heavy-duty model will blast through dog beds, horse blankets, leather leashes and tack. As a reminder to users, this model only uses Singer needles, so stock up accordingly. If you are having difficulties with the bobbin, first check that the bobbin casing doesn’t need to be reseated. This is a common occurrence with the Singer Heavy Duty 4432. All in all, this machine garners a thumbs-up from a wide range of users. 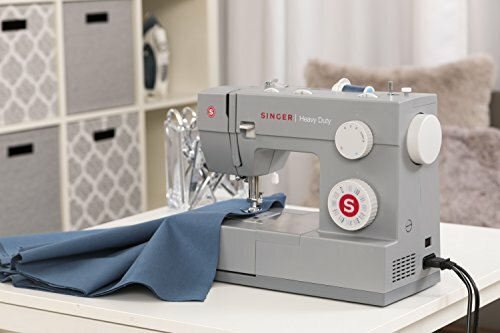 The Singer Heavy Duty 4432 sewing machine would be the perfect model to choose for a household of multiple sewing enthusiasts of different needs and abilities.